This Ongoing War: A Blog: 27-Jul-13: To defeat the terrorists, what one thing must a government never do? 27-Jul-13: To defeat the terrorists, what one thing must a government never do? What he said then when untested. What appears to have happened is that the political echelon has taken upon itself to usurp decisions properly and constitutionally made by the judiciary - and not for the first time. Yet we are able to see no acknowledgement by any of the relevant sectors of society - not the media, not the opposition, not the NGO sector - that this is what has happened. Why has such an extraordinary decision, one that brutally overturns basic notions of justice, met with such thundering silence? The answer cannot be that there is no other way. 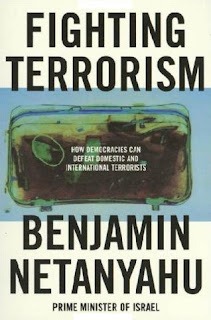 We are certain there is another way, and we have strong support from the acknowledged leading thinker in the field of how to deal with the terrorists. 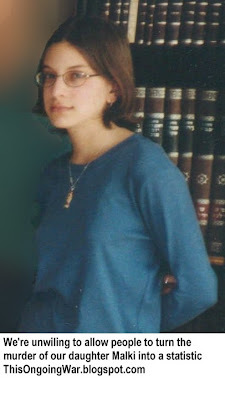 The writer of those words is a younger Binyamin Netanyahu. Eighteen years later, and as prime minister, he is facing precisely the test about which he wrote in his best-selling book. 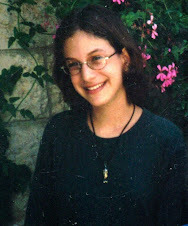 But 18 years is a long time - actually a lifetime if you think about murdered fifteen year olds like our daughter Malki. honor the principles of justice and decency on which our nation is based and remember the innocent victims whose loved ones are – yet again – experiencing unfathomable pain as a result of your choices. The result, you already know. A year later it appears the victims of the terrorists are, again, being disgracefully disenfranchised by the politicians.